New relationship aims to better serve the small business market. 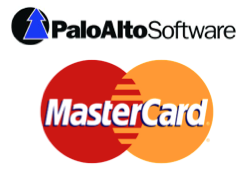 Palo Alto Software today announced at the Finovate conference in San Francisco a new relationship with MasterCard that will help drive small business success. 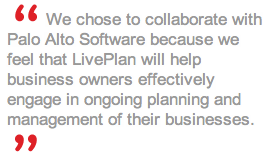 LivePlan, a business management tool from Palo Alto Software, will be available at an automatic discount to enrolled members of the MasterCard Easy Savings® Program. In addition, LivePlan will be integrated into the MasterCard Business Network, an online resource designed to streamline business operations and enhance productivity for small and mid-sized businesses. LivePlan is hosted in the cloud, giving small business owners access to their financial performance data from anywhere, so that they can see how they are doing at a glance, and make those critical business decisions easily and on the fly to ensure their growth. LivePlan includes a pitch builder tool that helps business owners create a visual summary of their business model and market opportunity, a template for developing a lender-ready business plan, and a Scoreboard feature that allows a business owner to track their actual financial performance against their plan. If a company uses QuickBooks for Windows they can also connect their QuickBooks data to their LivePlan Scoreboard and see how their business is doing with a single click.